A paratha is a flatbread that originated in the Indian subcontinent. It is still prevalent throughout India, Pakistan, Nepal and Bangladesh, where wheat is grown and is the traditional staple of the area. Paratha is an amalgamation of the words parat and atta which literally means layers of cooked dough. 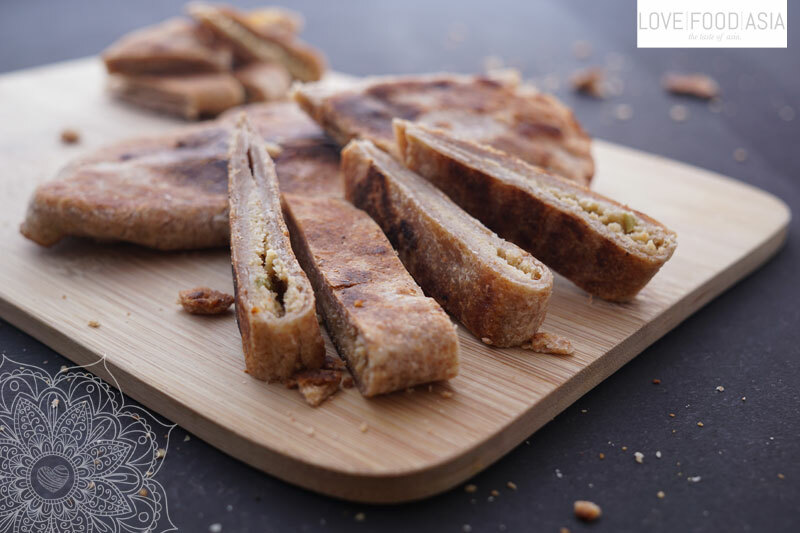 In our simple recipe we combined a typical Indian paratha with the delicious taste of the cauliflower. In just a few step you can cook a super tasty Indian side dish. Mix lukewarm water with flour, ghee, oil and salt using a mixer. Knead dough with your bare hands until you have a smooth dough. Leave in a bowl, cover and set aside. Heat ghee in a pan and stir fry ginger, garlic and green chilis for 2 minutes on medium heat. Stir in cauliflower, ground cumin and black pepper and stir fry for 2 more minutes. Deglaze with warm water. Bring to a simmer. Reduce heat and cover pan. Simmer for 4 minutes. Drain water through a sieve and set cauliflower mixture aside. Add fresh coriander when mixture is cold. Now back to the dough. Divide dough into 6 ball with same size. Use a rolling pin to make 6 flat circles (20 cm diameter). Add 2 tbs of the mixture in the center of the circle and fold dough from one side to the other. Press the ends of the dough together. Hold dough on two sides and pull it to make it more flat. Now heat some oil in a pan and fry parathas from both side until golden brown. (3-4 minutes on each side) Serve immediately.